Welcome to Colloredo Mansfeld Palace, its beautiful Dance Hall with the famous ceiling, where 200 years ago Mozart actually performed himself. 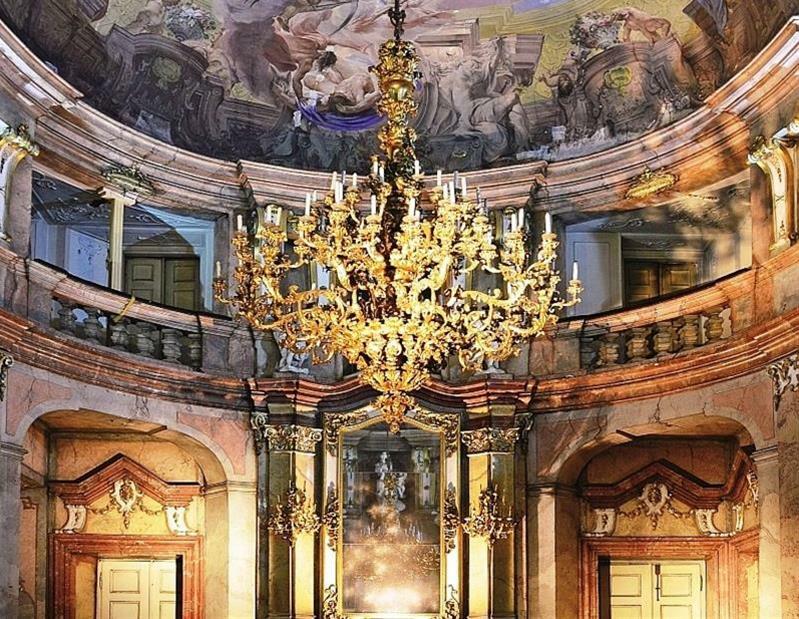 In this palace directly by the Charles Bridge you can enjoy an hour of classical music jewels. List of upcoming classical concerts in Prague will guide you through all events. Visit the Colloredo-Mansfeld Palace where Wolfgang Amadeus Mozart himself most likely performed. 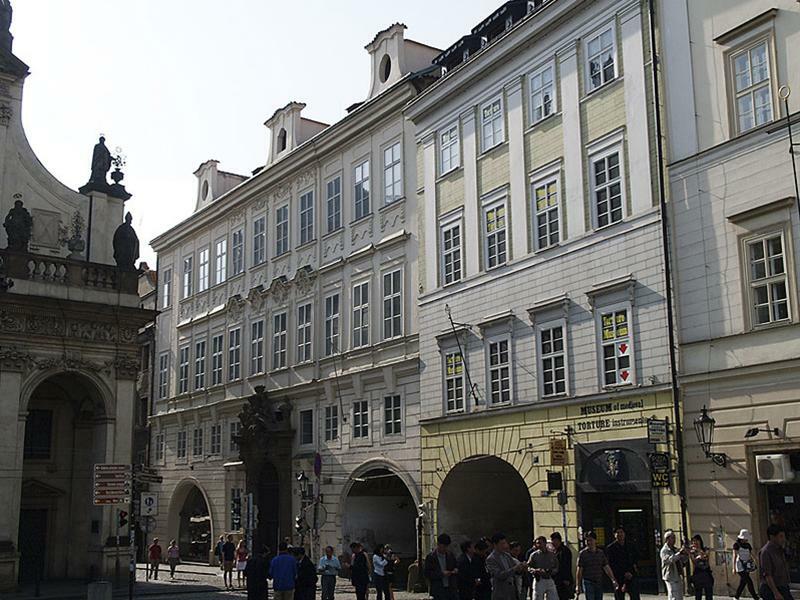 The late Baroque aristocratic palace is located by the Charles Bridge. This is also the palace where Milos Forman in 1983 filmed parts of his Oscar winning flm Amadeus. Built on Roman and Gothic foundations. In 1735 Prince Heinrich Paul Mansfeld bought a palace on the Royal Route and rebuilt it to the representative residence. The four wing building features sculptures on the portal (coat-of-arms of Prince Mansfeld, vases and angels) and a fountain with a statue of Neptune in the courtyard. The interior of Colloredo-Mansfeld Palace stands out for its magnificent main (dance) hall, so called "Piano Nobile" decorated by beautiful fresco paintings depicting Olympian gods. Amazing not only in terms of their artistic value, the frescoes are also unique as they have been left untouched since their creation in the 1760s, and preserved in great condition. This is something rarely seen elsewhere in Europe! This hall had most likely witnessed performances of Wolfgang Amadeus Mozart, as the Colloredo-Mansfeld family belonged to the most honored nobility at the time when Mozart often visited Prague (invited by noble families to give concerts). In 1840, the palace held the first exhibition of paintings by the Fine Arts Union. Since 2010 Colloredo-Mansfeld palace houses Gallery of the City of Prague who helds here mainly contemporary Czech art exhibitions. The Colloredo-Mansfeld Palace, designed by European architects and artists, is a great example of Prague's rich cosmopolitan history. What an inspiring and exciting event! An intimate setting with an ensemble that plays as a well-knitted team. It was inspiring to see how the artists interact and co-ordinate - due to the small venue and there being only a small group of artists and no conductor it was very evident how they worked together to perform in synch. The music was full-sounding and I could not believe that such a small group achieved this. The voice of the soprano was unexpectedly powerful - her appearance belied the vocal energy that was forthcoming. Please note that I also attended another event, which I rated poorly. My good rating for this event is not out of habit - it is truly worth it. To the extent that I would not mind doing it again this same week! I've been to several local concerts, but this is the one I always bring my visitors to. All the musicians are wonderful, but the Lecian brothers are astonishing. The Colloredo-Mansfeld Palace is gorgeous, and unapologetically faded. It feels as if you have slipped into the palace secretly for an evening of magic. I have never written a review before but this fantastic concert prods me to rise to the occasion. I have attended many professional and semi-professional concerts in the US and I honestly did not expect much from a tourist concert like this one. WOW – was I wrong!!! This event was the highlight to our weeklong visit to Prague The venue was a little aged. I think it would be a decent place to hold this sort of event if there was just better lighting but a full renovation is really needed. The size of room is intimate. We were fortunate to get seats in the front row, I would recommend getting tickets for the front section. Being only a few feet away from such talent was a once in a lifetime event. The performance becomes personal because they are so close to you – you see the effort, the intensity and the pure, raw talent. I was on the edge of my seat for the duration. The performances were simply exceptional. There were three soloists, all were remarkably talented and all three deserve center stage at big-time events. The mezzo soprano was spectacular. I am not an opera fan but it really brought tears to my eyes…such beauty. The violin and cello soloists I think are brothers and were also just exceptional. These are not glorified street performers – they are definitely the real deal who gave incredibly energetic performances to our small audience. Finally, the backup quintet was very, very good. It was nice hearing the base in these pieces, it provided a nice balanced sound. The program was short (one hour) but very engaging. The only thing I would suggest is to have the violin and cello soloists take a run at Humoresque (in the mode of Perlman and Ma). It would make a great Dvorak/Prague encore. For these guys who grew up with Dvorak it could be boring but I would have loved to see that piece played by these two immensely talented musicians, they would tear it up. If not Humoresque, then La Musica Notturna Delle Strade Di Madrid by Boccherini. Either piece would be fun way to close the show, they are my favorite pieces for cello and violin. The musicians were amazing and so was the choice of music they played. I regretted having to leave Prague on the following day as I'd have repeated the experience if I had been able to.